Looks like God has been listening to our prayers: R. Kelly is releasing more chapters to his classic hip hop opera, Trapped in the Closet very soon. Find out how to see the new (and surely epic) chapters for yourself. This. Is. Awesome. R&B genius R. Kelly is set to add more installments to the saga of Sylvester, Twan, Pimp Lucius and the rest of the Trapped in the Closet gang this year — and they’ll premiere on the Independent Film Channel when he’s finished. “The Alien is back and It has brought friends along. When I first began experiencing the unknown journey of writing Trapped in the Closet I knew after the first chapter that I had tapped into something that was not of this earth. And being the nosy person that I am, I, more than anyone, wanted to know what the second chapter would be,” he told Rolling Stone in a statement. We can’t wait! 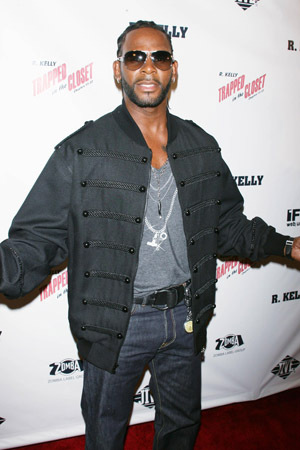 Kelly first introduced the “hip hopera” in 2005 with five chapters. The five-minute clips were an instant cult hit, leading him to create 22 total chapters that were all, basically, the most hilarious things ever — mostly because it didn’t seem like Kelly was aware how hilarious they are. Word on the street is that he wants to create another 32 installments in the series, taking Trapped in the Closet to a staggering 55 chapters. That would break some sort of record, right? In other Kelly news: His ex-wife, Angela Kelly, is set to star with the exes of Eddie Murphy, Will Smith, Jose Canseco and Prince in the upcoming VH1 reality series Hollywood Exes, set for air this summer. We’re so watching this, if only to find out what sort of craziness Angela reveals about her scandalous ex. Bring it on!